One of their ancestors was a ferocious chieftain who fought loyally at the side of the great warrior king Brian Boru in one of Ireland’s most bloody and decisive battles. Generations of others also fell on the field of battle, while succeeding generations of Kellys have gone on to achieve international fame – and not a small degree of infamy. Here is recounted the colourful lives and times of the Kellys. 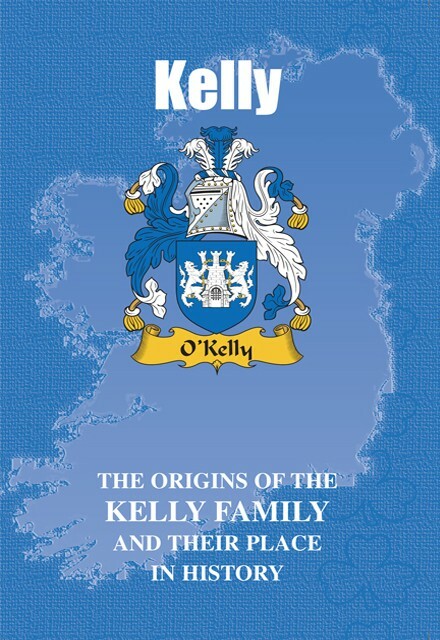 NAME VARIATIONS INCLUDE: Ó Ceallaigh (Gaelic), Kelley, Kellie, Kilkelly, MacKillely, O’Kelly, Gilkelly, O’Cadhla, and MacGoila. "One infamous bearer of the Kelly name was the Australian outlaw and folk hero Ned Kelly. Born near Melbourne in 1855, he was the son of John ‘Red’ Kelly, who had been transported to Tasmania in 1842 from his native Ireland after being sentenced to seven years penal servitude. Ned and his gang of bushwhackers became infamous for a spree of bank robberies and murder that lasted nearly two years and ended in a final confrontation with the exasperated authorities at Glenrowan, in Victoria, in 1880. Despite the protection of his homemade plate armour and helmet, Kelly was captured, tried, and sentenced to be hanged. The sentence was duly carried out in Melbourne Gaol, despite a petition signed by more than 30,000 ordinary citizens demanding that his life be spared."